It's not easy trying to find your zen while simultaneously mastering the 500 yoga poses that test your flexibility in ways grade school PE never did. If you'd like to pass on gymnast-level stretches without sacrificing the possibility of channeling peace and mindfulness, we found meditation app that can get you there. All you'll need is a charged battery and a set of headphones. If you are a beginner in meditation and want to find stress solution, then we recommend Sleeping Forest: Sounds of Forest for meditation that will surely bring you peace, prosperity and above all well-being. It’s hard to find peace of mind, living in this modern era full of rush and noise, so that’s why meditation and app’s like this slowly are becoming a must in our day to day life. Sleeping Forest, the meditation app provides incredibly beautiful and relaxing sounds from nature (forests, waterfalls, oceans) and birds that will assist to find your Zen spot, re-charge your batteries and rest the mind also. Many people are already practicing meditation and scientists are also testing the immensity of meditation’s benefits on the human system. If you’re skeptical you can try it and see for yourself if there will be the difference in your well-being. Sleeping Forest app will help you in overcoming depression, insomnia, anxiety and other similar phenomenons that are becoming more often in our modern living. The app will also help you in improving concentration and focus and will help in relaxation of tinnitus and migraine etc. It’s easy to use and free to download. 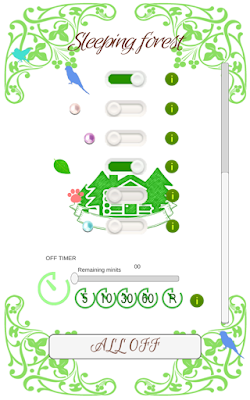 Sleeping Forest: Sounds of Forest for meditation is available on Google Play Store. Get it and enjoy your meditation!